Former cricketer and athlete of Maris Stella and St. Mary’s Colleges Negombo and soccer player of Jupiter Sports Club of Negombo, ruggerite, cricketer, soccerite and athlete of Royal Ceylon Air Force S. Dharmarajah popularly known among his colleagues as “Dharma” spoke to the Daily News at his residence at 260/220, Block F/4, Government Flats, Colombo 4. Q: - Can you tell something in brief about yourself and about your family? A - My name is Suprayer Dharmarajah and I was born on 26 October 1938 and my father is Vallipuram Suprayer an Attorney at Law and mother is Maheshwari a housewife. They hail from Thellipili, Jaffna but we lived in Negombo. In my family, I have one elder brother and an elder sister and a younger brother and a younger sister. I am married and my wife is Rajah Yogeshwari Dharmarajah and we live at the above address. Q: - What is your first school? A - Initially I was at Maris Stella and my Principal was Bro. Conrad. Later I joined St. Mary’s, to the Seventh Standard. Q: - Did you do sports in these two schools? A - At Maris Stella, I did Athletics and Cricket up to under 12 years and after moving to St. Maris I played for the under 14, 16 and first eleven cricket teams and took part in athletics. I commenced my cricket career as a wicketkeeper and a batsman and in my second year, I started as a medium pace opening bowler. My teammates were Kenneth Fernando, A. R. F. Fernando and Cyril Ernest to mention a few. Later Ernest joined St. Benedict’s College, Kotahena. I did athletics and my events were 880 yards, Javelin, and Discus Throw and I became the school champion and participating at the Western Group Meet I won first place in the discus throw. I could not gain a place in the Public Schools Athletic Meet. Later I joined Jupiters Sports Club, Negombo and played soccer for them. My teammates were Tuan Aliph, Lawrence and Quintus Fernando. Q: - What is your employment? A - After schooling, I joined the then Royal Ceylon Air Force in 1959. After my Combat and Military training course at Diyatalawa, I was drafted to the Supply and Logistics branch of Katunayake. Q: - Did you take part in sports whilst in the Air Force? A - Till my full-service career up to 1981 I represented in sports. I played Cricket, Soccer, Rugger and did Athletics. In my 22 year career period I played Cricket and Football for the Air Force in various tournaments and also for my branch at Inter Unit Tournaments. Initially, I represented the Air Force in the Daily News Trophy, later Donovan Andree Trophy, Sara Trophy and Inter Services and once I captained the Daily News team. In 1965 under K. M. Nelson we won the Donovan Andree Trophy and were promoted to Sara Trophy. I was a member of that team. In 1966 we played in the Cecil Horan Trophy and we came to the finals. The final match was with Colts Cricket Club and it was a limited over match and we lost to them. This is the first ever instance that a 50 over official game was played in Sri Lanka. Later we came up to the division two finals and lost to SSC. In the semifinals we beat Sebastianites at Prince of Wales grounds and I captured 7 wickets for 14 runs. In Rugger I played for the first fifteen and for the Inter Services and Combined Services. I represented them against Bosons a visiting team from England and I played as second row. In soccer I played throughout my career in the first and second teams and once I captained the team and my team mates were Mahinda Aluvihare, Preena, Aliph, Sadukeen, Hasheem Deen (Jnr), Somapala Fernando, Crowther and Vithanage to mention a few. I played under Preena and Mahinda Aluvihare and later they played under me also. Q: - Did you excel in athletics? 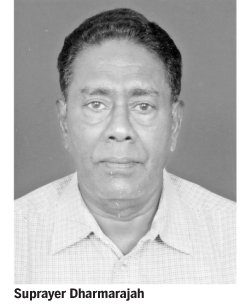 A - My athletic captain was Lakshman de Alwis. I did Javelin and Discus Throw. My team mates were G. George, R. A. C. Hubert, Hemasiri Fernando, E. M. D. M. Perera, Chelliah, Wijaya Bandara, A. L. M. Kahn to mention a few. Q: - Did you win colours? A - I got colours only for soccer because I represented the Combined Services team. But unfortunately I did not get colours for rugger after representing Combined Services also. During my time the Best Batsman was former Josephian Keerthi Caldera and the Best Bowler was former Sokian K. M. Nelson and Best All rounder past Sebastianite Norbert Fernando. Norbert is known in the Air Force as “Ever Green”. In club cricket it is Michael Tissera. In football it is none other than Mahinda Aluvihare in the Air Force and P. D. Sirisena Sri Lanka player. In rugger it was Viper Gunaratne and in athletics it was Lakshman de Alwis. Q: - You have done several sports for the Air Force. Did at any time it affect your job? A - Of course. Most of my service period I was at Katunayake. Due to taking part in sports I was out of my office and my officers did not recommend me for promotions. It was Group Captain K. D. S. Chandrapala, a great sports lover especially cricket when he became the Director of Logistics he fought for my promotions and I got backdated. Q: - After leaving the Air Force did you do sports for an outside club? A - I was selected to the Royal Oman Police Supplies and Logistics Branch and I served there for 26 consecutive years. I played Cricket and Badminton for my Department and I played for the Royal Oman Police Cricket team. When I was in Oman I had to undergo a knee operation and doctors advised me to refrain from sports. After my operation which I did in India, I had to stop all sports. Q: - What is the advice you can give to the young sportsmen? A - First it is discipline, then studies and fitness, punctuality and sportsmanship on and off the field. I feel English is vital to come up in life in the present day.